When it comes to Caribbean ports, there’s Cozumel… and then everywhere else. The Mexican island is booming and is the most busy cruise port in the word outside of Florida. Each year, about 3.5 million people make a stop in Cozumel and every major cruise line that sails the Caribbean makes a call there. Of course, that means there are millions of people looking for the best thing to do in the time that are in Cozumel. If you’re in this group, don’t worry. You aren’t alone. The good news? There are plenty of options for you to choose from. Below, we’ve rounded up a definitive list of all the things you can do in Cozumel. We’ve tried to include helpful links for booking activities where appropriate. 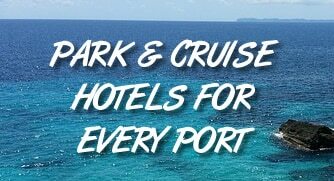 In many cases the items listed below can be booked via an excursion through your cruise ship. Note that these suggestions are in no particular order. This article contains links to Viator that are affiliate links. We earn a commission if you book through their website, at no charge to you. If you dock at the main cruise pier (the one that’s south of San Miguel, the main town on Cozumel), then you can lounge on a manmade beach with great views of the ship. As you leave the pier, hang a left past Fat Tuesday’s. Walk down a bit and on your left you’ll see a small beach with a number of loungers. The sand is white and soft, but there isn’t water access. Still, it’s free and convenient. The free beach at the pier offers a perfect view of the broadside of the cruise ships in port. Make your way there and get a photo of you standing with the ships in the background as a cheap souvenir to remember your trip. The first spot you’ll see as you exit the ship and make your way off the pier is a Fat Tuesday. This Mardi Gras-themed place has tons of drink specials and is right near the pier. In other words, it’s a party atmosphere. If you want to get a drink and party while in port, it’s the place to be… and a short walk back to the ship. When you’re on a cruise ship, it’s not too easy just to run to the corner store and pick up anything you might have forgotten. But in port, you’ll find there are several small shops in the pier area that offer up nearly anything you can imagine. Hit the pharmacy or bodega shops to pick up items you might need like Ibuprofen, sunscreen, deodorant, or anything else. The cruise ships will offer a lot of excursions and things to do in Cozumel, but they won’t mention that you can drink cheap, often just a stone’s throw away from the ship. Head into the pier area and you’ll see Three Amigos and several other bars and restaurants. These places are typically much cheaper than drinking on the ship, despite being only a short walk away. Located about 10 minutes south of the main cruise port, Chankanaab is a massive park with tons of things to do. The main draw of the park is a large beach that sits right on a rocky shore. The water is crystal clear and offers great snorkeling. In addition there is a pool, restaurants, a dolphin center, sea lion show, nature walk, and more. It costs about $20 per person, with additional prices for swimming with dolphins, ziplining, and other attractions. What would Mexico be without tequila? If you are an aficionado… or simply like tequila, then there are plenty of excursions that offer the chance to eat authentic Mexican food and taste test different tequilas. Check them out through your cruise line excursion desk. They also include lunch. In the touristy spots of the Yucatan, ziplines are everywhere. You’ll find ziplines at the theme parks in the area, including Chankanaab just a few miles from the cruise pier. Suit up, strap in, and glide over the jungle canopy. From t-shirts to glassware to hammocks to Mexican art, the area around the cruise piers has something for everyone. You can take time to stroll through the shopping areas and find anything you can think of with “Cozumel” written on it. When it comes to souvenirs, you won’t be without options. Cozumel is as well known for what’s under the water as what is above it. With electric blue water and gentle waves, the island is a snorkeler’s paradise. The waters surrounding the island are also abundant with colorful tropical fish. Through your cruise line you will find plenty of excursions offering snorkeling trips. You can also rent gear at nearly any beach club you visit. Want to get on the beach as quick as possible… and without going far from the ship? While there is a free “beach” in the port area, it’s manmade without access to the water. If you want water too, head just a little north of the main cruise pier to the Park Royal resort. There you can get a day pass to lounge on their beach and use their facilities. It’s just a short walk from the ship. Whether you realize it or not, you’ve seen Tulum. Located on the mainland, the ancient Mayan city is one of the most photographed destinations in the world. The buildings go right up to the cliffsides overlooking the water and stand dramatically over the scenery. Book an excursion and go visit the ruins for a few hours, usually followed by beach time, swimming next to the ruins. In the downtown area of San Miguel (Cozumel’s main city), you can walk the wide malecon with the beach on one side and shops and restaurants on the other. It’s free, a great way to work on the tan, and you can also pop in and out of any place that seems interesting. Officially, it’s the Museo de la Isla de Cozumel, but the Island Museum as it’s known by most cruisers is located in San Miguel. The museum covers the history of Cozumel, including some interesting exhibits showcasing items from both the Mayans and the Spanish. It’s only a few bucks to see, and best of all it’s a good way to get in some air conditioning on a hot day. From expensive diamonds to cheap souvenirs, Cozumel has you covered when it comes to shopping. Head to the waterfront in downtown San Miguel and walk from shop to shop. Careful, it’s easy to spend more than you expected as there are usually lots of deals for cruise passengers. The variety offered as the Discover Mexico Park makes the place a little hard to explain. It’s a cultural park, where you will find botanical gardens, models of famous Mexican buildings, and a Mexican art museum alongside tequila tastings, margaritas bars, and showcased on traditional chocolate making. If you want to spend a day off the beach, it’s a good option. What’s not to like for beach lovers? Located just a few minutes south of the cruise ships, Paradise Beach is a beach club offering up a huge freshwater pool, white sand beaches, and crystal blue water. Sit on a lounger under the palm trees while the kids conquer the in-water obstacle course. Restaurants and bars are on-site meaning you can spend an entire day here, no problem. Cozumel offers plenty of duty-free shopping where you can pick up alcohol, cigarettes, chocolate, jewelry and more at decent prices. You’ll make your way through the duty-free area as you make your way off the ship, so don’t worry about missing it. You should be a smart shopper, however, and know what’s a fair price before you shop. Don’t just assume you’re getting a good deal. How many restaurants have you been to where you can eat with your feet in the sand and then go snorkeling? The Money Bar Beach Club, located just a few minutes south of the cruise pier, offers just that. Head over and get your fill of food and drink before hanging out on the beach and taking in some of the gorgeous snorkeling right in front of the restaurant. Located on the strip of beach clubs south of the cruise piers and on the western side of the island, Playa Palancar is technically a free beach. Entrance is free, however, you are expected to purchase food and drinks — especially if you plan to use the chairs, umbrellas, and showers. Still, for people searching for a cheaper alternative to the beach clubs (which can cost $50 per person), it’s a great deal. You won’t find the Cozumel Pearl Farm on excursions lists from the cruise ships. In fact, it’s one of the more undiscovered things to do on the island. The trip is a little rustic and not a ton of people go on it. That’s actually a big draw. Located on the northern part of the island — away from the crowds — the tour offers education into an actual pearl farm, plus snorkeling and beach time. Of course Cozumel is a world-famous dive spot. Hook up with a local dive company (if you’re certified) and have them take you to the best spots. There are also lots of classes for beginners. The area is ripe with reefs, offering divers a ton to explore. Meanwhile, the waters surrounding the island are relatively shallow, making it ideal for beginners. Strap in and get ready to see the best views of Cozumel if you go parasailing. Several companies offer trips for about $60 per person for about 15 minutes. Head toward downtown on the main street to find places offering to take you up. Or you can book online at a few places before you set sail. Pronounced “ex-cah-ray” the park is a fun mixture of culture, water, food, and fun. Learn about the history and culture of the region before snorkeling and swimming in crystal-clear lagoons and underground rivers. There are also wildlife exhibits, or you can just hang out, have a drink and lounge by the water. The park is located on the mainland, so be sure to include extra time for transportation. If you’re seeking adventure during your time in Mexico, check out Xplor. The theme park is carved out of the jungle, offering high-octane rides like ziplines and ATV excursions. The big draw is the underground river that runs through a series of caves for you to explore. Great for kids as well as adults. From the same people who brought tourists XCaret, Xel-Ha (pronounced “shell-ha”) is another park that takes advantage of the ocean inlets and small rivers of clear water. Here you can snorkel, swim, and even cliff jump. There are also ziplines, bike rides and jungle trails if you want to have fun away from the water. If you love The Amazing Race on television, this is your chance to compete in a real-life version of it. You’ll hunt for clues and complete tasks around Cozumel and San Miguel, competing against other teams. Great for families, but wear walking shoes and expect to sweat! Sure you can go snorkeling. But that sticks you on the surface. Instead, with the Sea Trek helmet, you can actually walk on the bottom of the seafloor. The helmet fits over your head and shoulders, with an air hose attached. With this you can dive under the surface and explore just like you would if scuba diving. Ok, it’s technically a semi-submersible, but the effect if the same. If you want to get a look underwater without getting wet, there is an excursion you can take that allows you to sit in the bottom of the boat and check out the coral and abundant wildlife in the waters off Cozumel. It’s ideal for those who want a look but may not be up to snorkeling in open water. Jet boats are essentially full boat-sized jet skis. They can carry about a dozen people and knife through the water, with the ability to accelerate quickly and make quick 360-degree turns. In other words, it’s like a roller coaster on the water. In Cozumel you can hop a ride to get your adrenaline pumping. If you book the excursion, it’s usually accompanied with some beach time and lunch. What better way to see the island then with a local driving you around? Taxis on the island are happy to take you on a full tour so you can explore the sights at your own pace. Best of all, you’ll have a personal driver who will go wherever you want whenever you want to get there. So you can hit the beach, the town, the Mayan ruins on the island, and make it back to the ship without breaking a sweat. While most cruise passengers hang out on the western side of the island, the beaches on the eastern side are typically nicer and much less crowded. Be careful, this side of the island is usually windier and the water can be a bit rougher. Still, if the weather is good it’s a great way to head to a beach without the big crowds. You’ve heard of snorkeling. You’ve heard of scuba diving. But what about snuba? It’s a mixture of the two. Like snorkeling you don’t have to worry about air tanks, and like scuba diving you can go below the water. The key is that you have a long air hose to breathe through, giving you full mobility to go deep below the surface. Tours are available around the island or through the cruise ship excursions. Whale sharks are the largest fish in the world, measuring up to 40 feet and 45,000 pounds. Don’t worry, unlike Great Whites or other species of shark, whale sharks post no real threat to people. That’s why it’s popular to go swim with them as they cruise the waters off Cozumel. It’s an unforgettable experience that you’re not going to get the chance to do anywhere else. Keep in mind that the tours are only available in-season, which coincides with the summer months. Didn’t bring your clubs? No problem. At the Cozumel Country Club you can get in 18 holes, borrowing a set of their clubs. You also don’t have to be a member to play. It’s best (although more expensive) to get an early start before the tropical sun makes it too warm to play. Rates are about $160 for everything you need. Just show up and the course provides everything else. Want to get a little wild? Cruise lines offer 4×4 excursions — either on a four-wheeler on a ATV buggy — through the jungle. You’ll likely get a little dirty, but that’s the point. After the trek, you usually then have a few hours to hang on the beach and have lunch provided. Not a bad way to spend the day for people that want some adventure. For decades before tourism, Cozumel was all about fishing. These days you can charter a boat to head out for a few hours and fish the rich waters off the coast. It’s ideal if there are several people going along so that you can split the cost of a charter. Most tourists see only the main promenade that runs right by the water or the touristy shops and restaurants. But take a turn into town and you can find some cute houses and sights in the neighborhoods of San Miguel. It’s a cool way to get a feel for authentic Mexico. Beaches in Mexico are a little confusing. Technically they are free, but hotels block access to the beach through their properties and have no issues in acting like they own the beaches, putting out chairs and umbrellas for use by their guests. That’s why it’s usually easiest just to pay a few bucks to get a day pass from the hotel to use their facilities. This typically comes with a chair and umbrella, as well as lockers and showers. It’s a nice way to spend a day Cozumel. If you don’t want to go far and have a lot of fun, there is a Margaritaville right near the main cruise pier. Head down and sip a margarita (or any other libation) while the tunes play and you munch on your bar favorites like burgers and nachos. Best of all if you have a little too much to eat… or drink… it’s a very short walk back to the ship. Want a cheap and easy lunch? Crazy King Burrito is the second-highest-rated place to eat in town according to TripAdvisor, coming in just behind a chocolate shop. The specialty is burritos (obviously), which are rather larger and perfect if you had a little too much to drink the night before. Pair it with a cold Mexican beer or a glass of Coca-Cola and you have the perfect lunch. One of the top-rated place to eat on the island isn’t even a restaurant. TripAdvisor rates Chocolateria Isla Bella as a top restaurant. In actuality it’s a small chocolate shop with tons of tasty treats. Stop in and pick up a dozen of the chocolate bites to take back to your cabin. Rolandis has several locations in the Yucatan, including nearby Cancun and Isla Mujeres. There’s a good reason for its popularity — great Italian food in beautiful surroundings. Pizza and breads are wood-fired, and you have a wide choice of seafood and pastas. The view is killer, and the restaurant is also a great options for vegetarians. If you haven’t had enough boat rides in taking a cruise, try one of the ferries that goes the 12 miles from Cozumel to Playa del Carmen on the mainland. The trip is fun — the fast-moving ferries offer great views, as well as indoor and outdoor seating. Once in Playa del Carmen, you can hit the beach, grab some lunch, or go shopping. Cenotes (pronounced see-no-tay) are large caverns where underground water has made its way to the surface. Because of the rock this water has gone through it’s highly filtered freshwater that’s crystal clear… and cold. The area around Cozumel is rich with cenotes and they make amazing swimming spots to explore. Several excursions will take you to these spots where you can swim and enjoy the natural beauty that the Yucatan has to offer. If you simply want to keep out of the sun, then heading to the movie theater on the island is a good idea. The seven-screen theater shows American movies, usually subtitled in Spanish. It’s also pretty affordable compared to U.S. movies, so it makes a cheap way to spend the day. Often cited as one of the new 7 Wonders of the World, Chichen Itza is the most famous of the Mayan cities in the Yucatan. It’s a few hours from Cozumel, but several tours will take you there and get you back before your cruise departs. Be aware, a trip to Chichen Itza will take all day. It’s not ideal if you’re traveling with small kids. There is no shortage of way to get on the water in Cozumel. Case in point are the catamaran tours that offer the chance to sail in the crystal waters off the island, snorkel, and eat lunch. Most cruise lines will have this as an option on their excursions. Expect prices to run between $70-100 per person. Horseback riding is a unique way to see Cozumel. Trips are offered around the island (including Mr. Sanchos) and can take you around the jungle, on the beach, or both. Note that weight and mobility limits may apply. Escape Rooms have become extremely popular in the United States, and even Cozumel offers one. You have an hour to solve a themed puzzle with clues to find your way out of a locked room. If you’ve ever wanted to be a detective, this is your shot to try your hand. Want to get your exercise while also doing some sightseeing? Check out a bike tour of the island. It’s a cheap way to get around and see the sights without having to keep to anyone else’s schedule. Ok, technically it’s not something to do in Cozumel, but when in port, it’s a great time to hit the spa on the ship. On port days most people leave the ship meaning the spa has a lot more openings for its services. Hang out on the ship, get a massage and do it on your schedule! One of the little-known gems of the island is its planetarium. It’s open Monday-Saturday and offers a 3-D projection dome, astronomy shows, and even an observatory. It’s a cheap way to spend the day in the air conditioning while seeing some cool things. Obviously it depends on if there is a game happening and if it’s going on during your stay in port, but a local baseball game is a memorable experience. The field is a short cab ride from the port. Ask a taxi driver if they know if there is a game going on. Sure it’s a little bit touristy, but there’s a reason that places like Senor Frogs are popular — they are a lot of fun. There’s one right by the cruise ships and you can hang out right next to the most beautiful water in the world, having a blast with other cruise passengers. If you want to be more low-key, snag a table around the edge of the restaurants instead of by the bar. If you don’t pay for wi-fi on the ship, you can find it in the port area. Pancho’s Backyard (listed above) has free wi-fi for their customers and you’ll find other networks around the port. Spend a few minutes checking in back home, writing an email, or making video calls to tell everyone how much you’re enjoying your trip. Mexican vanilla is famous the world over for its flavor. And while it’s not as popular an export as tequila, many people still stock up while they are in port. Take home a big bottle that will last you for years. They are for sale in several shops around the port. 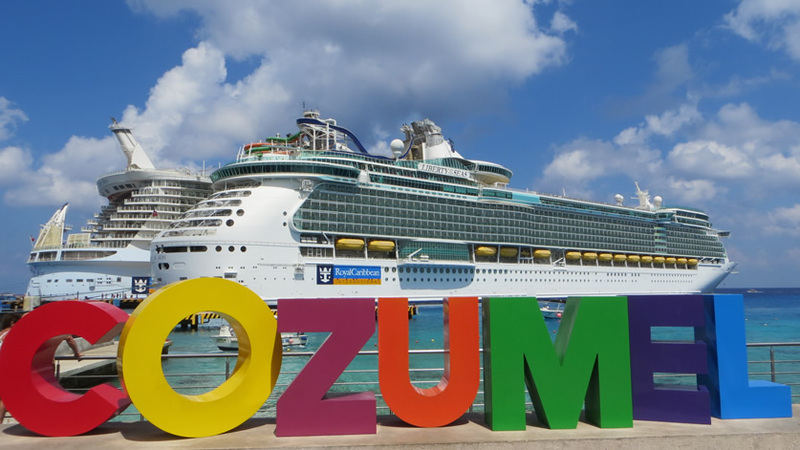 One of the best spots to have your picture taken is in front of the Cozumel sign. In the background you’ll have the ships docked and you’ll never forget where you were. The sign is located at the pier where Margaritaville is located. You might not be able to access it if your ship docks at the other piers. No, Cozumel doesn’t have any real canyons. But when the big cruise ships dock, they tower over the pier, creating the feeling of being at the bottom of a canyon. Best of all, it’s usually shady (because the ships block the sun) and breezy. There are benches where you can sit and enjoy the cool breeze while watching passengers go back and forth. It’s a nice way to relax before you head back on the ship. For some people, it’s the most boring thing imaginable. For others, it’s the best way to relax. It’s your vacation. If you want to just stay on the ship and enjoy some peace and quiet while everyone else on the ship heads into port. Sit by the empty pool, have a drink in hand, and enjoy yourself without ever stepping on shore. Headed to other nearby ports? See our list of things to do in Costa Maya on a cruise and our guide to Progreso. How Much Time Is Spent in Port on a Cruise?